poet, short story writer, literary and art critic, essayist, anthologist, translator. 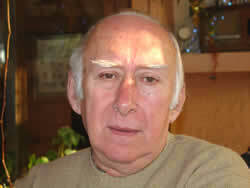 Born 1934 in Skopje. Graduated from the Faculty of Philosophy in Skopje. In 1981 he was habilitated at the Faculty of Philology “Blaze Koneski” in Skopje; gained his Ph.D. in 1987. Worked as a research fellow and was editor for the Cultural and Art Board with Television Skopje. In 1982 he became an associate professor at the Department of General and Comparative Literature at the Faculty of Philology in Skopje, since 1988 he has been a full time professor. Was editor of the literary journal “Razgledi”. Correspondent member of the Académie Mallarmé in Paris and a member of the European Literary Academy in Luxembourg. Member of the Macedonian Academy of Sciences and Arts. Member of the Macedonian P.E.N. Centre. Member of the Macedonian Writers’ Association since 1961. Works: Another city (poetry, 1959), Unseeing (poetry, 1962), The taste of Peaches (novel, 1965), A mannequin in the scenery (poetry, 1965), Summer rain (poetry, 1967), Signs (short stories, 1969), Contemporaries (criticism and essays, 1971),The night coach (short stories, 1972), Star balance (poetry, 1973), Diving Bell (poetry, 1975), The Dreamer and the Emptiness (poetry, 1979), The net for the evasive (criticism and essays, 1980), A unicorn hunt (short stories, 1983), The dream compass (poetry, 1984), Ariadne’s thread (criticism and essays, 1985), Hypnopolis (poetry, 1986), Underground palace (essays, 1987), Demons and Galaxies (study, 1988), Planet in Panic (poetry, 1989), Aldebaran (notes and travelogue, 1991), The Mythical axis of the World (criticism and essays 1993), Risks of the Trade (poetry, 1993), My cousin Emilia (novel, 1994), Panics (poetry, 1995), The court poet in a flying machine (novel, 1996), Stories from Paris (notes and travelogue, 1997), Astrolab (criticism and essays, 2000), Wild league (novel, 2000). Has compiled a number of anthologies: “The Black Bull of Summer” (1963), “French Poetry – 20th century”, “Black Tower” (1976), “Contemporary Macedonian Poetry” (in Serbo-Croation, 1978), “Cosmos in the Barn (in Dutch, 1980), “Tower” (in Uzbek language, 1981). Awards include: “Miladinov Brothers” (1967, 1973 and 1986), “Grigor Prlicev” (1974 and 1989), “Racinovo priznanie”, “Kiril Pejcinovic – Tetoec” and the Awards by “Mladost” and “Nolit”.